The stereo speaker system Proxima2 is the successor of Proxima awarded by the highfidelity.pl magazine with the title ?best product 2008?. While designing the new version all the suggestions from the audience and all flaws indicated in the test have been taken into account. 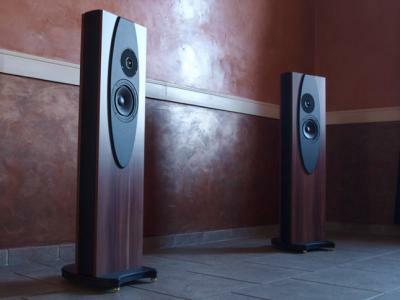 The introduced changes resulted in considerable improvement of low frequency response, reproduced space and general sound presentation are concerned. The speakers became more friendly for the amplifiers and more natural in listening. Undoubtedly the advantage of Proxima2 will be ability to listening to music with very low volume levels and also easiness of drive by low power amplifiers. Proxima2 received totally new 2nd order crossover with phase and impedance correction circuits. The excellent Jantzen Audio Z-Superior, Z-Standard and Cross-Cap capacitors were used to build these crossover. Combination of capacitors were selected during listening sessions. The specially designed crossover filters allowed to eliminate all the resistors combined in series or in parallel with the tweeter. Thanks to this, very clear, detailed and open sound has been achieved. At the same time the tone balance between all the sound frequencies has been sustained. New crossover also improved the dynamics and sound power. The emphasis has been put on precise rhythm and recordings atmosphere. All the crossover elements are paired with the 1 0x1.b8e410809102p-379ccuracy. Coils, made of Oxygen Free Copper, are prepared with the greatest care of repeatability. Elements are mounted on a plate and connected directly with each other taking into account the shortest signal flow. Geometrical planning of the elements on the plate made it possible to create one ground point for entire crossover. Proxima2 has changed also visually. READ MORE on www.divineacoustics.com !! !